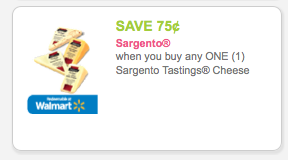 Price Chopper Starting Sunday: Profitable Sargento Tastings Cheese! Deal: buy 4, use (4) $0.75/1 (use zip code 77477) plus $3/$10 saving star ecoupon (based on shelf price, shelf is $2.99) = 4 FREE + $1.04 profit!! *you can get a 2nd $0.75/1 print under zip code 04572. Coupon shows "only redeemable at Hannaford" but does not say that when printed.